Howdy! Below are some pictures I wanted to share with you and the stories they represent. Double-click on any to get an enlarged view of the picture. Depending on the speed of your computer and internet connection, it may take a minute for the photo files to download, and enlargments will also take some time to download. 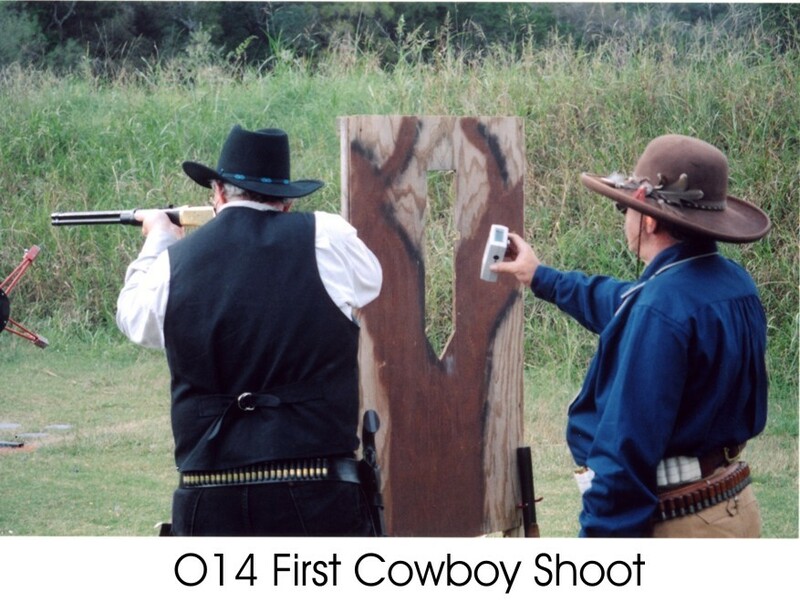 The first line of photos are pictures taken during my first cowboy action shooting match which was with the Alamo Area Moderators in Bulverde, Texas on November 22, 2003. 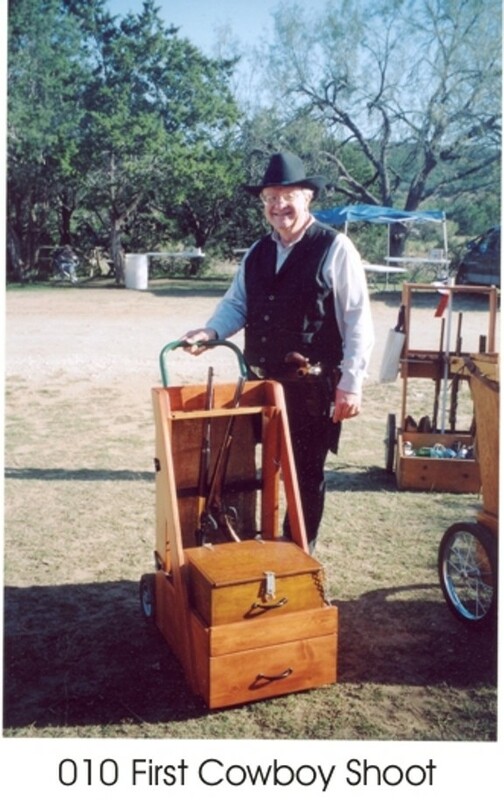 I had just finished building my gun cart depicted in the first picture three weeks before this picture was taken with the match with the Moderators. The second line of photos are pictures that illustrate my photography hobby (the other "shot" doc activity) and illustrate some of the things I've learned about computer-edited photographs. 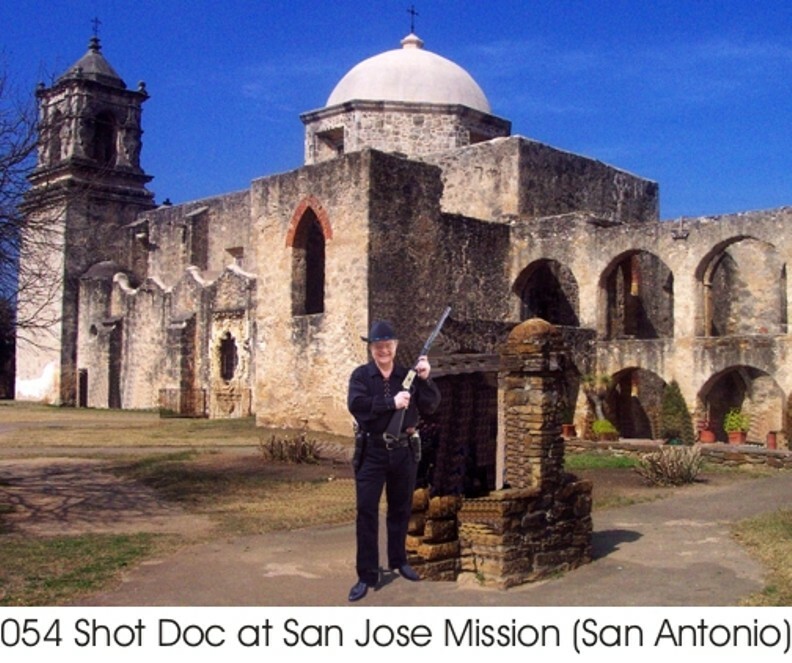 I take two pictures--one of me as Shot Doc in my back yard and the second with my wife and I at the San Jose Mission in San Antonio. 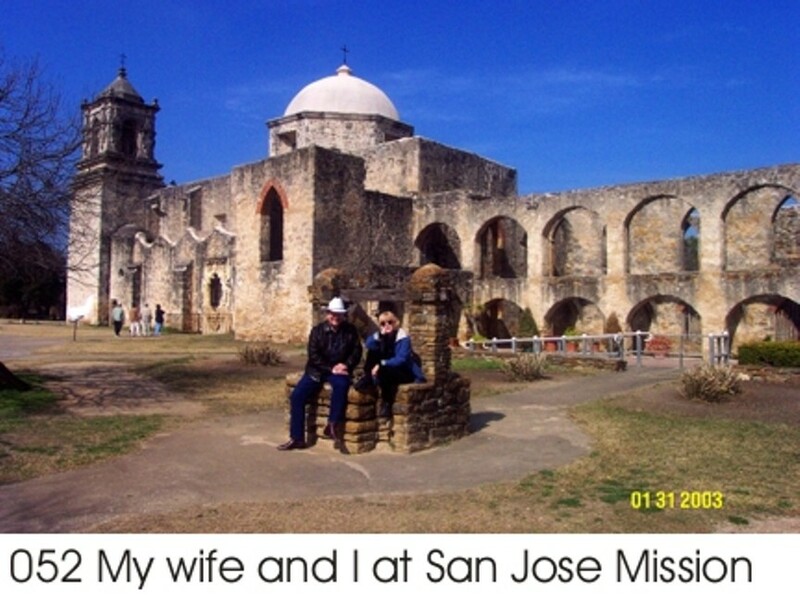 I then take me out of picture #1, remove me and my wife out of picture #2, and insert Shot Doc in picture #3. I also took out the other tourists in the background of picture #2 and "touched up" a few other things. 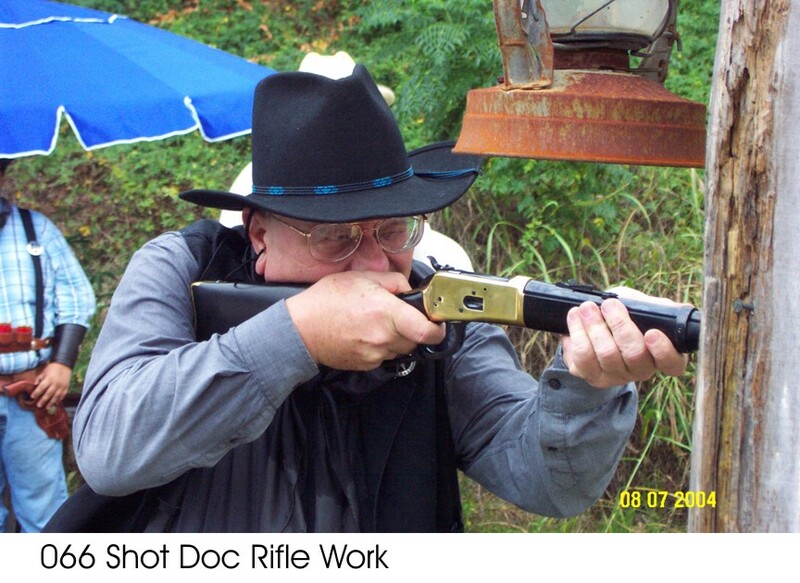 You know that picture #3 is a fake since I would have had a hard time getting my rifle through the gates. (I will never trust another picture again if I can do this kind of editing with the fairly basic computer equipment I have). 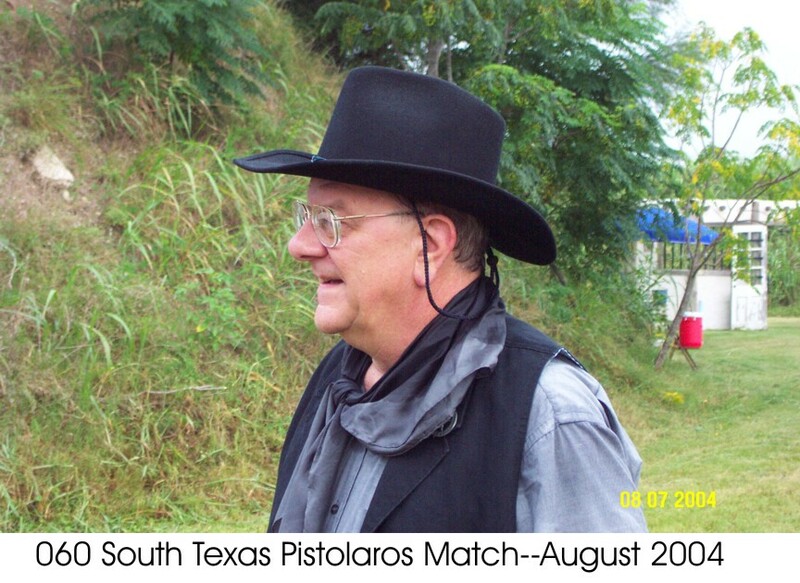 Line three displays some photos from a Cowboy Action Shooting match with the South Texas Pistolaros in August 2004. The second picture illustrates the importance of safety in any match. 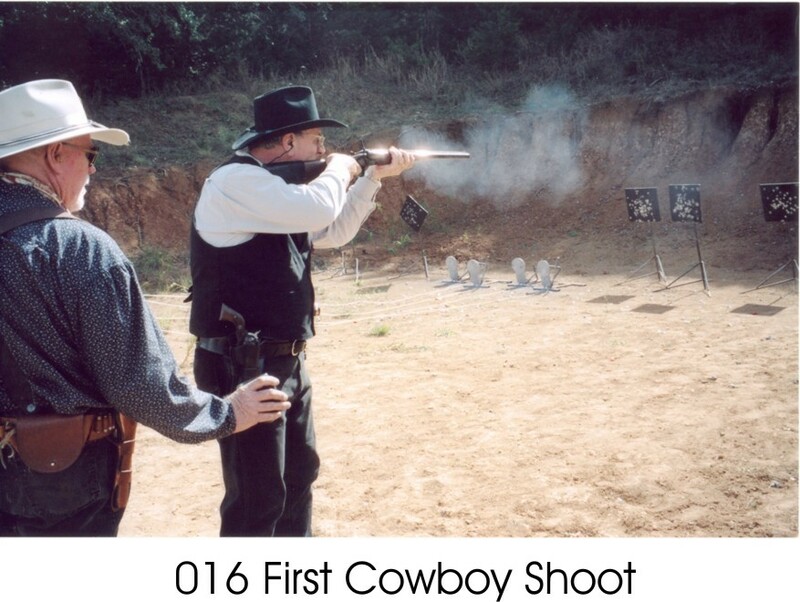 In that second picture I am at the unloading table where a fellow competitor at each stage makes sure my guns are empty before I leave the stage area. 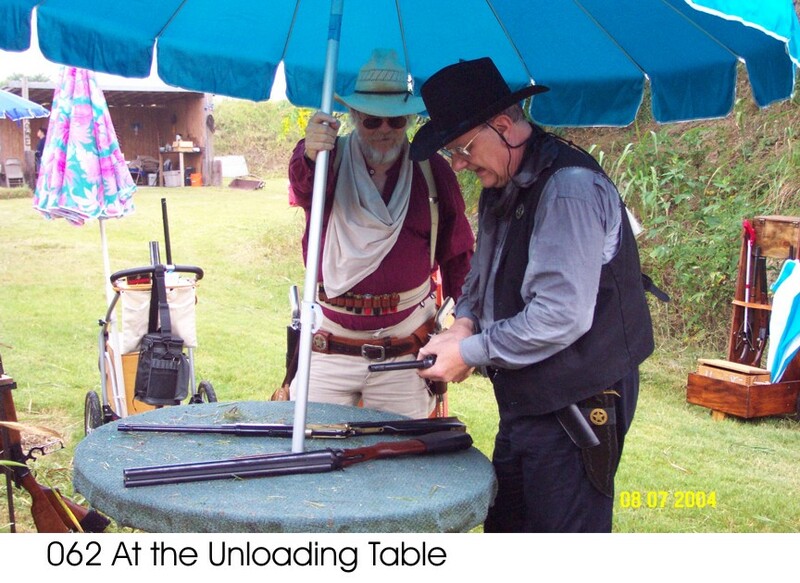 There is also a loading table at each stage where you have to show that in loading your single-action six-guns that the hammer is in fact resting on an empty chamber. 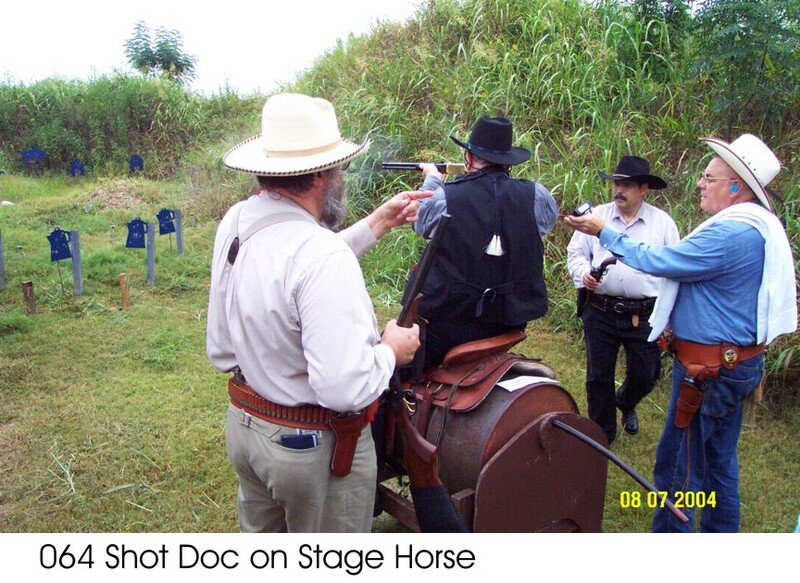 The third picture is me at one of the stages in which you have to sit on a staged horse to shoot at the targets. 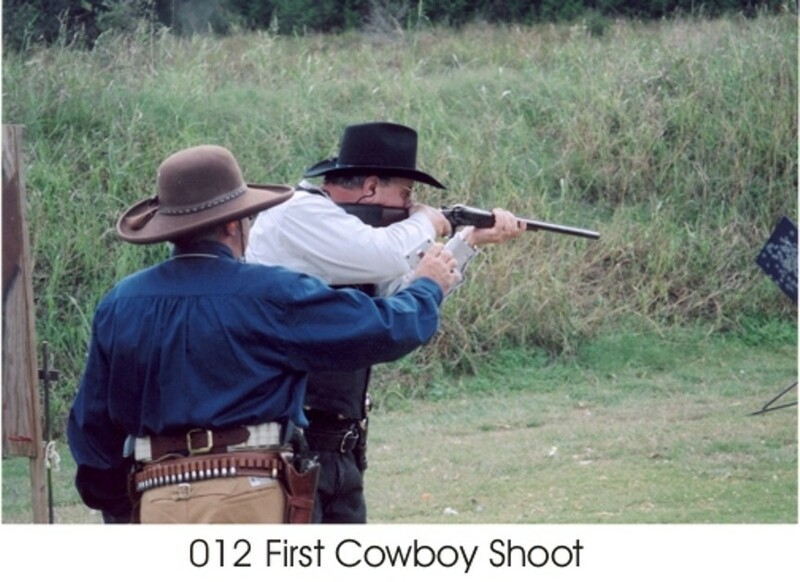 (In case you think that it is hard to hit the targets sitting in such a position...you are right!) The last picture in that row is me using my rifle at another target stage in that match. By the way, my son-in-law, Bill, took the pictures on the third line. He previously worked as a photographer...and it shows in his picture set-ups. 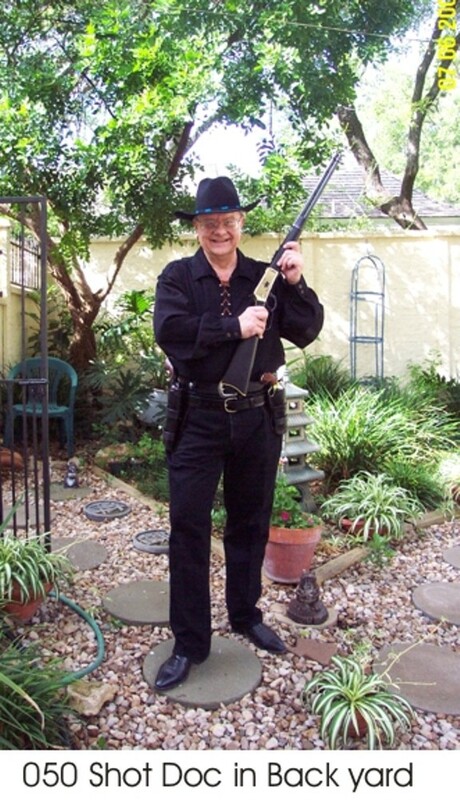 The pictures on line four include some additional personal shots. First on that line is still another photo edited picture of our first grandchild, Kathryn Rose Jordan, born November 22, 2004. She is only four weeks old in this picture, and the "edited" part should be obvious. 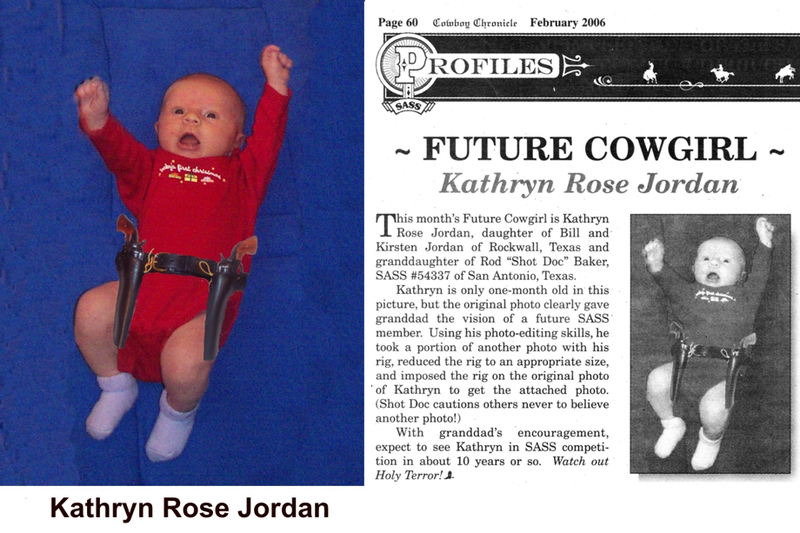 (Note--this picture was accepted by the Cowboy Chronicle for their "Future Cowboy/Cowgirl" feature in the February 2006 issue...by double clicking this picture, both an enlargement of the photo and a scan of the article will appear.) 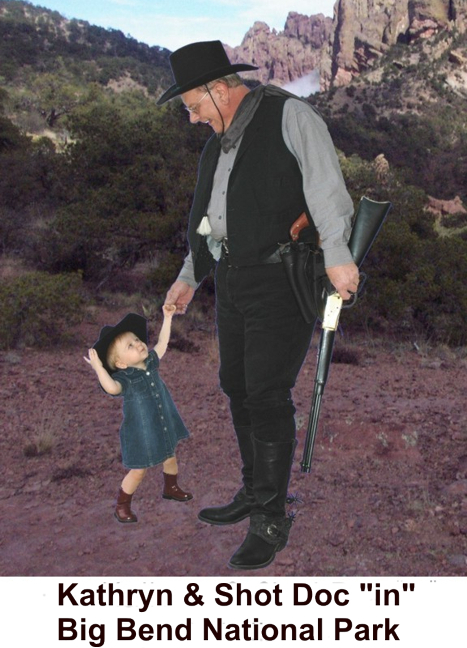 The second picture on line four (still another edited photo) is one of my granddaughter and me taken October 2005 superimposed on a photo I took in the Big Bend National Park earlier in the year. The third picture on line 4 is that of our first grandson, Grant Alexander Jordan, born New Year's Day 2007. He's about 11 months old in this picture. 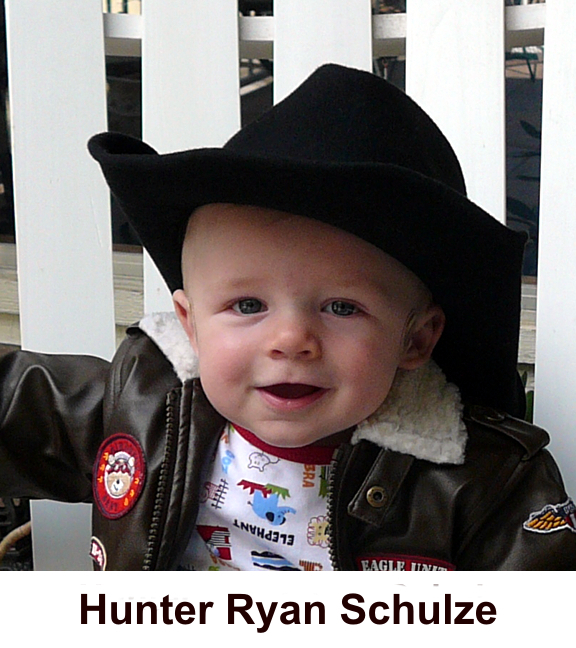 The last photo on line four was taken of our second grandson, Hunter Ryan Schulze, when he was almost 8 months old. 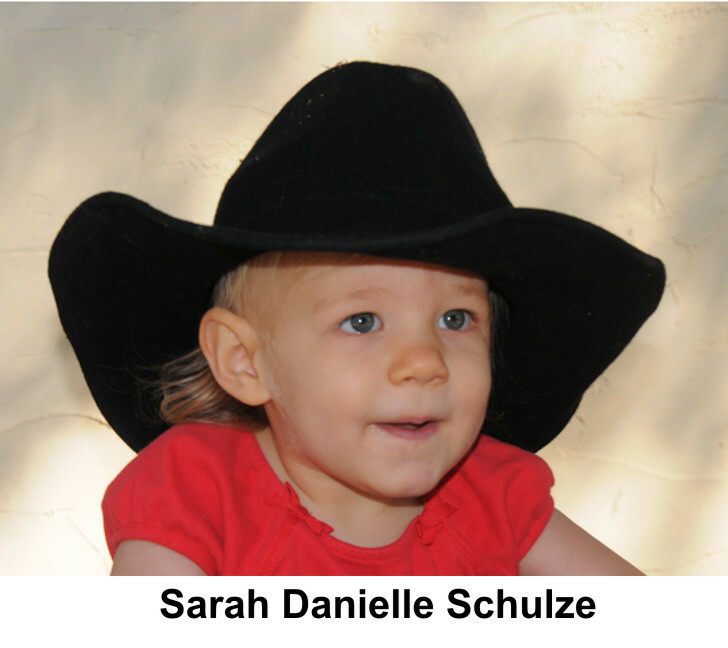 Most recently, we got out the grandchild cowboy hat in April 2011 for a photo of Sarah Danielle Schulze, our second granddaughter. That photo begins line 5, and she was 18 months old when this picture was taken.